Although a properly designed water feature is low-maintenance and works with Mother Nature, on occasion it needs a little nurturing. Just like anything else you find in nature, a pond has different needs at various times of the year. We break it down and make it simple for you to understand so that your pond is truly low-maintenance year-round. The most important spring maintenance task is cleaning your pond. A pond cleanout should be performed annually, in the spring before the water temperatures climb above 55°. During the hot summer months, the biggest priority for pond owners is keeping the algae under control! This can be achieved by preventative maintenance and natural algaecides. Leaves will fall into your pond during the Autumn months and can settle onto the pond floor, leading to debris buildup which can cause algae and unsightly water conditions. 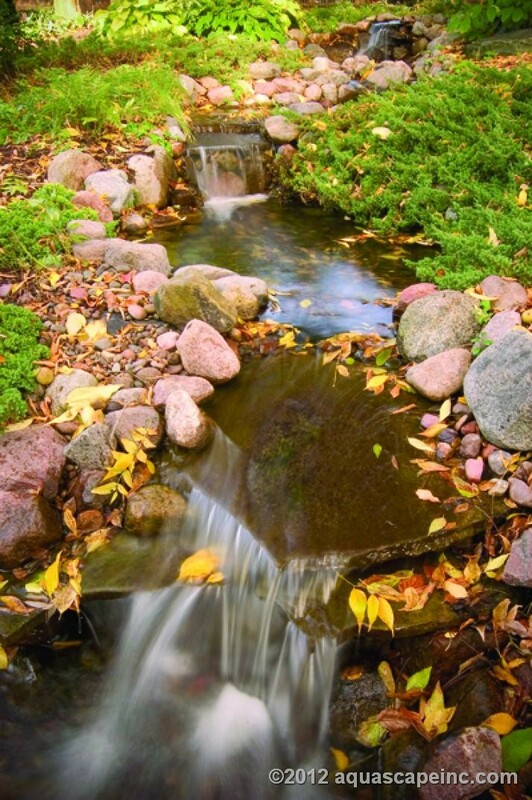 Your pond goes into dormancy during the winter months, and your fish will go into hibernation. Make sure you keep a hole in the pond for gasses to escape and for aeration. The snow is melting, the birds are chirping, and the sun that you've been missing has finally decided to show its face. In order to keep your pond functioning properly, you may want to give your pond a fresh start by giving it a spring clean-out. Ideally, you would start your spring clean-out early in the spring before the water temperature creeps up above 50°F. At this temperature, your pond hasn't begun it's annual balance, and the fish are not as active so the clean-out won't be so stressful to them. The best way to tell whether your pond needs to be cleaned out? If the water looks the same in the early spring as it did the previous summer, it's probably okay to skip the clean-out. Now it's time to roll up your sleeves, put your waders on, and get ready to clean out your pond! Don't want to clean your own pond? We can help! Lily tabs - might as well fertilize those lilies while you're in there! Now that you know why you should do a clean-out, your next step is to learn how to do a clean-out. Now don't worry - it's really not as complicated - just a little dirty. If you follow a few easy steps, your clean-out can be done quickly and easily. Check out these easy-to-follow steps. Start Draining the Pond - We rent out a professional Clean-out Pump for those who are tackling their own clean-outs. Call us at (253) 863-3499 for rates and availability. Be sure you use some of the pond water to fill a container with pond water for the fish. Summer is here and you've earned some quality time with your pond, and when better than summertime - perhaps the most beautiful time of the year for most ponds. Summer is your chance to truly enjoy the pond. 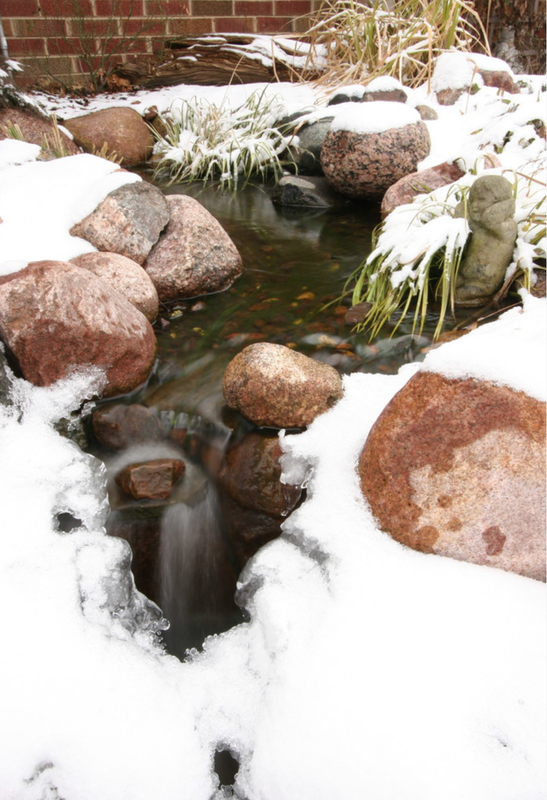 Pacific Northwest winters are generally mild enough to keep your pond running all year with no additional maintenance steps, however, when the cold snap does arrive, it's good to know how to take care of your pond and your koi. Maintenance is usually the determining factor in whether or not a pond owner keeps their pump running in the winter. The primary maintenance responsibility at this time is to make sure there is enough water for the pump(s) to operate properly. Pump size is also an important consideration when determining a waterfall's ability to operate during the winter. A pump that provides at least 2,000 gph can be operated throughout the winter without a problem, as long as it runs continuously. The moving water will usually keep a hole open in the ice around the waterfalls and in front of the skimmer. And then there are your fish friends. What will become of them over the winter months? Do they hibernate like a bear and wake up in the spring when you're there to greet them for a clean-out? Can they survive in only two feet of water? Won't they freeze solid into little precious fish-cicles? The fact is that ornamental fish will do just fine in two feet of water, as long as some form of oxygenation is provided, and a hole is kept in the ice to allow the escape of harmful gases. It's recommended to place a waterfall pump in a basket, bucket, or pump sock and surround the intake of the pump with stones to prevent clogging. Place the pump on the second or third shelf of the pond so the surface water is broken by the aeration. The agitation from the pump will prevent freezing and provide oxygen. Another option is to use a floating heater/de-icer in combination with a small submersible pump (at least 150 gph). You can place the small re-circulating pump on the first shelf of the pond, bubbling at least one inch above the surface. Floating heaters are the most common method of keeping a hole open in the ice. Unfortunately they won't provide oxygen for the fish, and some can be expensive to operate. Do not confuse a floating pond de-icer with a water heater. A pond de-icer won't heat the water; it will simply keep a small hole open in the ice. Be sure to place it away from re-circulating water to avoid moving the heated water. Just remember that although they seem like they're sleeping down there, they still need oxygen in order to keep going and to meet you when the ice melts! If you feel that you can tackle the responsibilities of keeping your pond running during the winter, then go for it, because there's nothing quite like the breathtaking view of the winter pond in all its glory!